This dish is something we go to when we don't have much time but still want a full meal that we know will be good. Sometimes Jon will make himself some spicy shrimp to go with it. Bring a pot of water to a boil. Cook broccoli rabe in the water for about 2-3 minutes. Take it out with tongs (don't dump the hot water) and put it into a bowl of ice water. Take it out after a few minutes and squeeze out any excess water. Chop into 1-2 inch pieces. 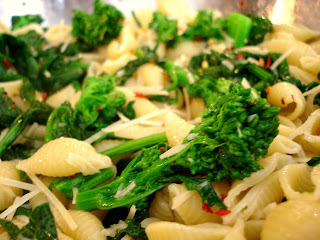 Cook your pasta in the pot of water that was used for the broccoli rabe. In the meantime, heat olive oil in a large pan. Add garlic and red pepper flakes, saute. Be careful not to burn the garlic - you are only trying to heat and infuse the oil. Once the pasta is done, add it to the oil. Add the broccoli rabe and toss. Add some salt and cheese. Quick, super easy, and very tasty! Looks like a great summer meal! Yum.